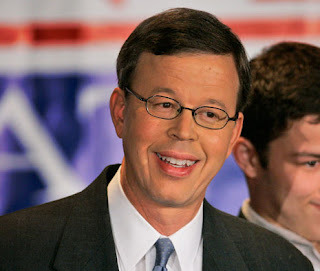 Jim Talent, our state's one-time U.S. senator, won't be our state's next U.S. senator. (Link to story here.) And that's unfortunate. Talent would be the best person for the job. He has the experience, integrity, and conservative credentials to, again, be a great senator. He is a man of honesty and integrity. He is a man of intelligence ant thoughtfulness. In fact, he's probably too intelligent and thoughtful for Congress. While Talent would have been the best candidate to replace current senator Claire McCaskill, McCaskill should not rest too easy. This is a reddish state already and one can sense the hue darkening. Several formidable Republicans are ready to enter the GOP primary for a crack at McCaskill in 2012 - a year that Republicans statewide and nationwide are fired up and ready to take back the majority in the Senate and to take back the White House. 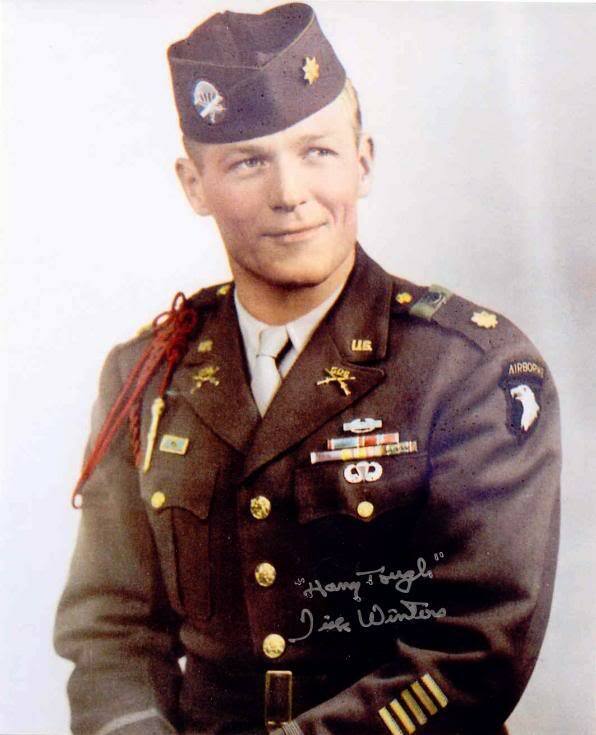 Ann Wagner, Sam Graves, Jo Ann Emerson, and Ed Martin have been mentioned. And Sarah Steelman has already thrown her hat in the ring. Just about the only Missouri Republican whose name hasn't been mentioned as a potential challenger for McCaskill is Brock Olivo. But give him time. When the crowded Republican primary heats up in Missouri, let's hope that it remains civil. All of the GOP candidates should keep their eyes fixed on the true opposition in the race - McCaskill, Harry Reid, Barack Obama, and the Democrats . . . not each other. Keep in mind, all of you, that you agree on much more than you disagree. Don't get personal and wound the winner so badly that he or she can't manage to win in the end. As for Talent, I don't think he'll be getting bored without a race to run. In addition to his other jobs and interests, it looks like he'll be keeping busy with the as-yet-unofficial Mitt Romney campaign for president. Good luck to you Jim - or should I say Secretary Talent? While it amazes me (and, frankly, embarrasses me when looking at my own life's accomplishments) that a 40-year-old man is Chairman of the House Budget Committee, I'm happy that Paul Ryan (R-Wisconsin) is on the job there. His response to Barack Obama's State of the Union speech was well-written and well-delivered. Great job Congressman Ryan. Keep up the good work! "We [Republicans] believe, as our founders did, that 'the pursuit of happiness' depends upon individual liberty; and individual liberty requires limited government. Limited government also means effective government. When government takes on too many tasks, it usually doesn't do any of them very well. It's no coincidence that trust in government is at an all-time low now that the size of government is at an all-time high. "The President and the Democratic Leadership have shown, by their actions, that they believe government needs to increase its size and its reach, its price tag and its power. Whether sold as 'stimulus' or repackaged as 'investment,' their actions show they want a federal government that controls too much; taxes too much; and spends too much in order to do too much." 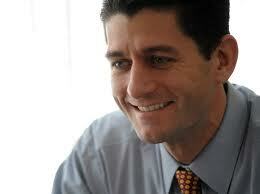 Paul Ryan sounds like a man worthy of belonging to the party of Ronald Reagan. Now it is time to follow though! In tonight's State of the Union address to Congress and the nation, Barack Obama put a the best face possible on his policies and proposals. But that's easy to do when you don't worry about being honest. The president's speech tonight was full of fibs. Don't take my word for it, check out what Calvin Woodward at the Associated Press had to say - link here. Ronald Reagan's birthday is approaching. On February 6, the Gipper would have been 100 years old. This pending centennial, apparently, has given USA Today cause to publish tributes from Reagan's admirers, like John Boehner, Mitt Romney, Sarah Palin, and Ed Meese. Even Sam Donaldson wrote a semi-positive remembrance. But one tribute has taken me aback. Barack Obama penned this piece lauding the Reagan's leadership and legacy. Has the ultra-liberal changed his thinking? Has the conservatism embodied by Ronald Reagan broken through and convinced Obama of the errors of his thinking? His philosophy and love of freedom? His view of government and its role in the lives of the American people? And that brings me to the State of the Union address, which Obama will deliver tomorrow evening to a posturing group of politicians who think that sitting in a chair next to someone you disagree with makes a difference. 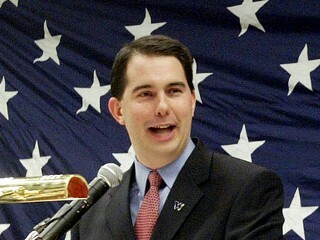 But the biggest phony of the night will be the one reading the TelePrompTer. Obama, no doubt, will speak of bipartisanship and cooperation. Of moderating our difference and setting a new tone in Washington. Blah . . . blah . . . blah. It would be worth ignoring completely if it wasn't so dangerous. Faced with the fact of his policies' huge defeat in November and the power shift in Congress to the GOP, Obama is almost certain to paint himself as a moderate tomorrow night. But do not be fooled. The man lives and breaths liberalism. He's a tax-and-spend Democrat who has done and is doing everything in his power to socialize this country - emphasis now our healthcare system. Ronald Reagan said "Government is not a solution to our problem, government is the problem." Barack Obama is a far cry from Ronald Reagan. 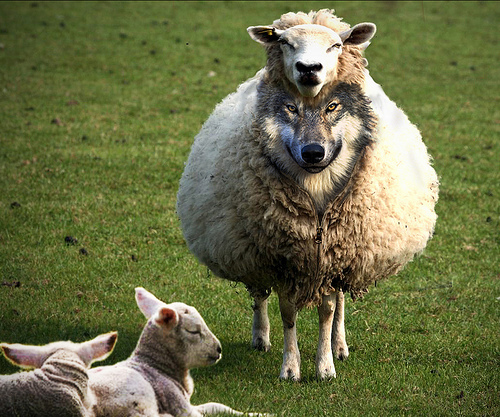 Beware of the wolf in sheep's clothing. Global Warming Study "seriously flawed"
Shockingly (no sarcasm here) these "climate scientists" have admitted that the flaw existed . . . and the media is reporting it. But, of course, it was just "an honest and common mistake." Use caution before reading the story at this link. It is about a doctor in Philadelphia who operated a "clinic" performing late term abortions in the sixth, seventh, and eighth month of pregnancy. His methods are described in the story as "illegal" and "dangerous." His facility is described as "a filthy, foul-smelling 'house of horrors.'" Conditions were "barbaric." Dr. Kermit Gosnell has been charged with eight counts of murder. One woman apparently died of an overdose of painkillers while awaiting an abortion. Seven babies, at least, were delivered alive and, then, when even 21st century America knows that it is wrong, killed. The details are in the article. The story itself, of course, is sickening. What this man, and his employees, did is, of course, horrendous -barbaric - inhuman. 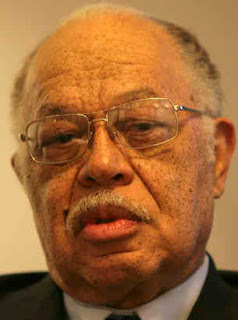 But what sickens me even more is the description of "a typical late-term abortion" that is given in the story for comparison with the murders with which Gosnell has been charged. How on earth can those "typical" procedures be described as anything less than horrendous - barbaric - and inhuman? Yet no other doctor faces charges? How long did the "new" tone last in Washington? Not very long for Democrat Steve Cohen. I remember a commercial from the 1980s featuring L.A. Dodgers pitcher Orel Hershiser describing pitching as "like climbing a mountain" or "going to battle." Hershiser's use of those analogies (similes?) irritated me at the time (believe it or not, I was more easily irritated back then) and I lashed out in verbal diatribes (since the blog had not yet been invented) whenever the commercial aired and anyone else was in earshot. "Shut up Orel! You've never climbed a mountain! You've never been in battle! How would you know what either one was like?" Apparently, no one is allowed to use the word "killing" in political discourse anymore. Even when it refers to the "death" of inanimate objects or ideas. How, ever, can the wonderfully-named city of Town & Country discuss how to control its rampant deer population? Or what would happen if a researcher today discovered a cure for cancer that "killed" malignant cells? I guess they'd have to "disable" those cells instead. Right? English is not the most beautiful language in the world. It is certainly not the most logical. But it is certainly colorful. But, in the aftermath of a deranged man's act of violence, the political correctness crowed is trying to scrub some of that color from our language. 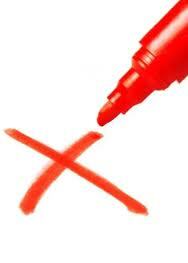 If John Boehner had been referring to an "employee killing" piece of legislation, that would be over-the-line. But no person in his or her right mind could possibly believe that a reference to a piece of legislation "killing jobs" is inciting violence. It doesn't even mention violence. How can it be violent to "kill" something that is not physical, not alive. 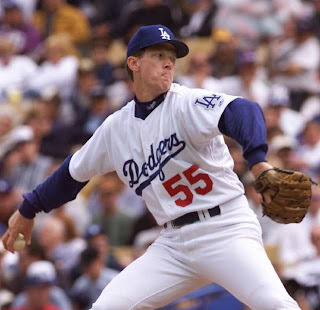 Now, whatever I can say about the Orel Hershiser commercial, his language was colorful and I still remember it about 25 years later. Stop watering down our language! Stop making us sound like a bunch of P.C. wimps! How should the U.S. government attack the deficit? The American people are clear in their answer . . . reduce spending, don't raise taxes. That's according to CBS News. Check out the story here. Is anyone at 1600 Pennsylvania Avenue, Washington, DC listening? That's my question for those accusing Sarah Palin of hate, divisiveness, and vitriol. Don't the posters themselves intentionally serve to enrage people with fear? Justify their violence? More so than Sarah Palin ever has. 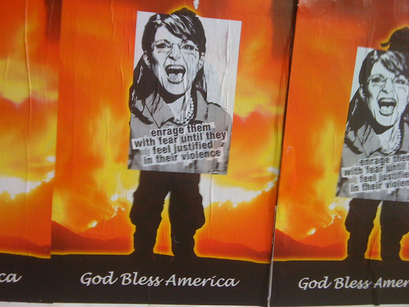 These anti-Palin posters are showing up in San Francisco. Link to story here. I've got a pool table Albert, you're welcome in my basement anytime. 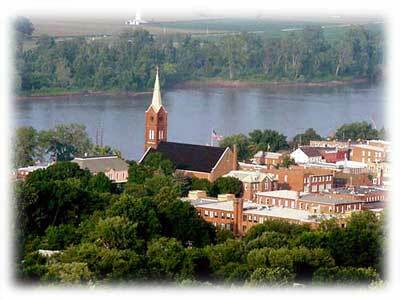 The time is now to cut Missouri's personal and business tax rates, or eliminate them entirely. And let the boom begin. May he rest in peace. And may his family and friends be comforted by the grace of Jesus Christ. For any of you who have not see the miniseries, do not hesitate, watch it as soon as possible. It is the best production that I have ever seen on television. Kudos to Tom Hanks and Steven Spielberg for that. For any of you who have not read the book, do not hesitate. It is even better than the miniseries. I spent some time in the car today, much of it listening to talk radio - everything from NPR to KMOX to 97.1. 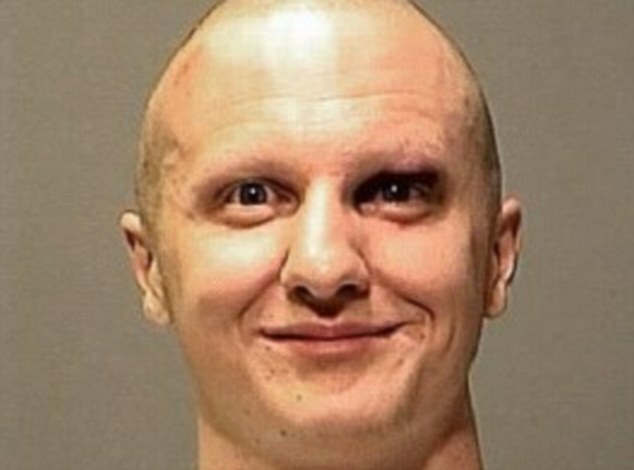 The hot topic this morning was Jared Loughner's Saturday shooting spree. That, of course, is a worthy topic. Thankfully, it is still an unusual and newsworthy event when a man takes out a gun, starts shooting, and kills six random people while injuring fourteen more, including a member of Congress. But folks across the dial weren't content to talk about the news - what happened and what we know. No, the talking heads were aghast over climate of American political rhetoric which they seem to blame for making this Loughner-nut act like the nut he is. The media's focus today seems to be on Rush Limbaugh, Sarah Palin, and Glenn Beck - blaming them (as the sheriff in Tucson did) for Loughner's actions. Those three, and other conservative voices, are vaguely blamed today and all to often for "divisiveness" or "hatred" or "vitriol" or "negativity". What that really seems to mean, though, is that they disagree with the media, the Democrats, and the folks who currently hold power in Washington, D.C., and want to keep it and acquire more. Conservative voices are often discussed by their opposition without any reference to specifics. Take criticism spouted by Clarence Dupnik (quoted in the story linked above), the Pima County, Arizona, sheriff investigating the rampage: "The kind of rhetoric that flows from people like Rush Limbaugh, in my judgment he is irresponsible, uses partial information, sometimes wrong information. . . . [Limbaugh] attacks people, angers them against government, angers them against elected officials and that kind of behavior in my opinion is not without consequences." What, Sheriff Dupnik, did Rush Limbaugh say that caused this nut to go off and start shooting? Did he suggest violence? Have you ever listened to Rush's show? Or have you just heard your friends second-hand criticism of what they think he said? 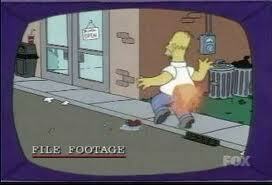 What did he say that was irresponsible? Limbaugh, Dupnik said, "angers" people against government and elected officials. But anger is not synonymous with violence. Anger, often - usually even, does not result in violence. What is wrong with anger in the context of political discourse? Nothing, of course. Anger channeled to violence is wrong. But political rhetoric is not responsible for doing that particular wrong. Certainly not in this case. Jared Loughner is - to the best of my barely informed knowledge - nuts. And Jared Loughner (or possibly his mental illness) is responsible for his actions. So, what's the reason? They don't, and didn't, prevent accidents. Hooray for reality and the Constitution winning one for a change! "The right of the people to be secure in their persons, houses, papers, and effects, against unreasonable searches and seizures, shall not be violated, and no warrants shall issue, but upon probable cause, supported by oath and affirmation, and particularly describing the place to be searched, and the persons or things to be seized." So says the Fourth Amendment to the United States Constitution. Keep that in mind when reading this story from the San Francisco Chronicle. The story arises at the confluence of modern technology and the Fourth Amendment. It seems that every human being on the planet these days is carrying a cell phone. Typically one that does much more than make and receive telephone calls. 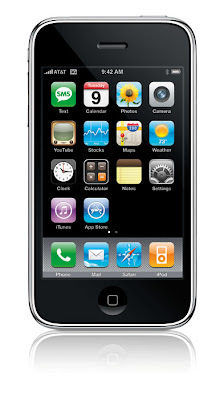 Modern "smart" phones contain schedules, photos, video, financial documentation or access to such information, contact lists, call histories, text and data files, music, and much, much more. So what happens to those cell phones when a police officer confiscates it upon request. In California at least, the police can seize it and search its contents, without any limit. That ability has passed constitutional muster at the California Supreme Court. Dissenting Justice Kathryn Mickle Werdegar aptly declared that "the decision allows police 'to rummage at leisure through the wealth of personal and business information that can be carried on a mobile phone or handheld computer merely because the device was taken from an arrestee's person.'" It is patently, unambiguously, and ridiculously unreasonable for police to search the entire contents of a person's cellular phone or computer without warrant upon an arrest for jaywalking - or anything else for that matter. Look, I'm no ACLU liberal - and I doubt I've ever before been accused of that. I don't believe that a drug dealer's Blackberry is sacrosanct. However, I do believe in the Constitution and Bill of Rights. If the police arrest a bad guy, and he's got a cell phone which likely has specific incriminating evidence on it, no problem. Get a warrant! Then have at it. Without probable cause and a warrant, however, the police need to keep their nose out of folks "effects". Thankfully, the California decision is not binding nationwide. In fact, the Ohio Supreme Court issued a decision just over a year ago that reached the opposite conclusion. The issue is now quite likely to wind up at the U.S. Supreme Court. Keep your fingers crossed that the men and women in black robes will do their job and defend the Constitution whenever that time comes.